Just what is this animal the woodcock? Why is not a major hunting species? It is the hunter’s ultimate challenge but not really well known out of the eastern states. Hunters seek game animals ranging in size from quail to elephant but seldom do they hunt the diminutive woodcock. No matter what he is called, be it Timberdoodle, bog sucker, wood snipe, bec, night partridge, mud snipe, wall snipe, bog borer, siphon snipe or owl snipe, the woodcock is a fascinating quarry. About the size of a man’s fist, with a head the size of a golf ball, it does not present much of a target. Woodcock plumage is brown, black and gray with large black eyes, set well back on the head. Its long bill, about 1 3/4-inches in length, bores into the mud in search of worms. Once the sensitive tip of the bill locates a worm it grasps it by the hinged portion near the tip. Above ground this bill grabs ants and flying moths. The entire body sits atop short spindly legs sometimes missing. There are some of these little rascals who have lost their legs and still lead a relatively normal existence. Legs do not seem to be essential to their survival. What is essential is good habitat and weather. Heavy freezes on their wintering grounds and otherwise unfavorable weather during the migration are the chief mortality factors. Man’s pollution of the land and clearing it for civilization also figure in the destruction of the species. Because woodcock tend to return to the same areas each year leads to man coveting those hunting spots. The areas are coverts. They are patches of woodland that dense from low to 15-feet high. They also are knolls and swamps with assorted shrubbery. Near them are small open fields. The birds need a clear space 6-inches above the earth so the woodcock can forage at will. They avoid thick grass. Unlike most upland game birds, woodcock relish wet conditions. Young forests or brushy cover with ferns, are good. The woodcock can forage under the fronds of the ferns near the edge of the forest land. In hot weather they move to clean forest floors of dense stands of conifers. It is cool there and the soil is rich, black and moist. Finding the right type of habitat does not mean that the woodcock will be there. One must look for other signs. For some reason good habitat in two locations that appears perfect will sometimes have birds and otherwise not have any. The most sure sign of woodcock in the area are the boreholes drilled into the soft ground by feeding birds. Also present are chalk-colored splashes (droppings) the size of a quarter. Pre-season scouting must include some sightings of birds. The best time to seek woodcock is in the evening as they fly from spruces at low altitudes, dropping into the briars and other cover in open fields. At twilight they feed in thickets and then feed all night in the briars. The birds normally leave about a half hour before sunrise for the forest protection. Once spooked from their lair, they seldom fly straight for any distance. They flush by taking a step and rising straight up briefly. They flash the underside of their tail feathers making them look much larger than reality. Woodcock make a twitter sound flying slow but erratically. They often circle and suddenly change speed or direction. The first sight of a flushed bird one is surprise by how closely they flush and how well they avoid contact with the twigs and tree limbs. In fall the hunter finds both migrating and breeding flocks. The migrating birds may be in one covert and no birds founds in another. The covert may be empty one day and full of birds the next. The migrating birds travel in loose bands and move slowly unless an extreme cold front hits. Woodcock hunters need local both local small game licenses and migratory bird stamps. Many of us misjudge that buck coming out of the early morning mists. The difference in the perceived size of an animal on the hoof, and the actual size of his antlers sometimes becomes what is “ground shrinkage.” Each year some “monster” bucks fall in Illinois and other Midwestern states. But sometimes what looked like a “monster” turns out to be somewhat less. How can one judge the actual size of the animal’s antlers before deciding whether or not to shoot or wait for something larger? Experience is probably the best bet. Experience comes from looking at lots of deer. Veteran hunters are constantly looking at deer antlers. They view them in a friend’s home; they view them in the wild as well as in captivity. They view them online at various websites. They attend sports shows where displays of major trophy animals give one the chance to see the “big uns.” They study the record books and learn the scoring systems. No single factor makes a great buck. It is a combination of attributes. Here are some of the main areas in which deer score well. A famous outdoor writer is attributed to have said; when you see a great deer you know it. You know it because he is awesome just in his appearance. 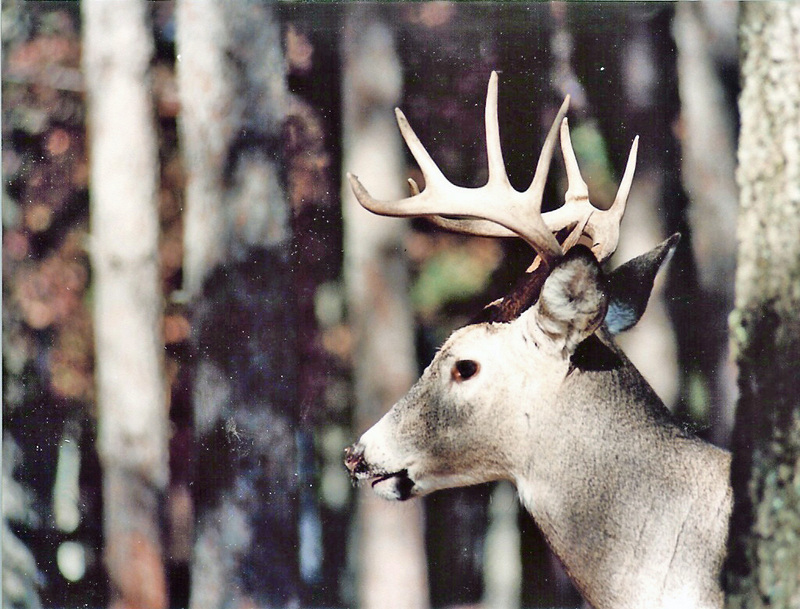 Ear spread is the best way to estimate the inside spread of a dear’s antlers. The distance tip to tip of expended ears is about 17-inches. This is for a mature buck looking straight at you. Looking from the side it is a bit more difficult to estimate size. The closer the main beams come to vertical line through the end of the nose, the more the chance he is a big one. He needs to have great length to the main beams to reach that far forward. One quick way to estimate the number of tynes on a buck’s rack is to count the number of fighting tynes. These are the tynes other than the end of the main beam and the eye guards. Thus a buck with two fighting tynes is an 8-point buck. That is, he has a main beam point, an eye guard and two tynes in between. This is on one side and it is quick judgment to see if the other side is the same. End result, and 8-pointer. If the deer has exceptionally long tynes, or heavy mass to his rack, he is keeper. When a deer antler is scored for the record books, they add the length of each main beam, the inside spread, length of all normal points and the circumference of various locations on the points. Thus you can see the overall mass of the antlers is just as important as the length of the tynes. The more someone looks at deer in the wild, the better he is at field judging a good trophy. Now is the time to begin scouting deer for the upcoming season if it has not already begun in your area. The deer are still relatively calm and allow you to look them over carefully. Later, after the velvet is gone from their antlers and the woods are full of hunters, they are not as likely to stand still while you check them out. Public land is a good place to check them out. Places like forest preserves and parks are good for this type of scouting. 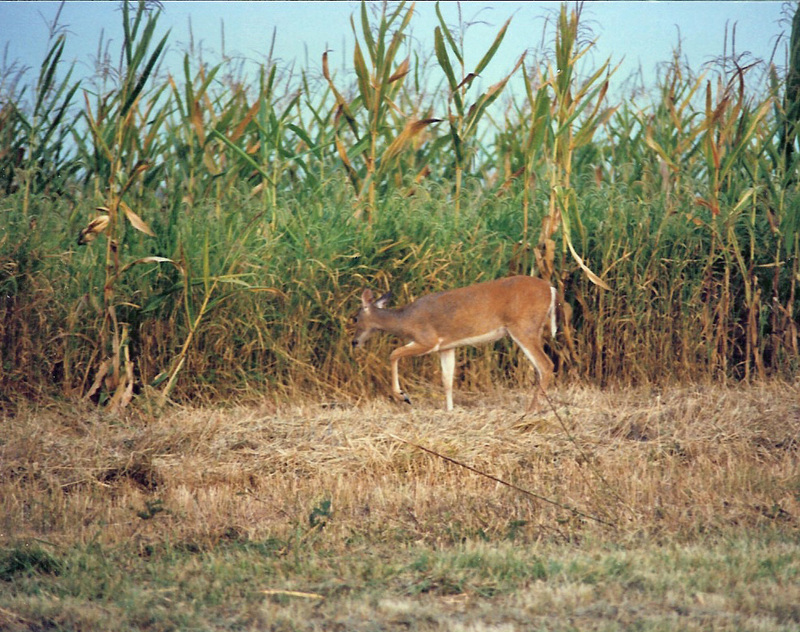 Observance of deer in the field in the early fall can pay big dividends this fall. Avoid the disappointment of “ground shrinkage” by doing your homework. As white-tailed deer move into the late rut and post rut period they change her feeding habits and behavior. Successful deer hunters should change their tactics as well. This is especially true of treestand placement. The latter part of deer season for bowhunters and the start of firearms seasons is a time to move back into deep cover of woods, swamps, farmland sloughs, river bottoms and thick stands of cattails. Big bucks will stay there and not go out to feed with does and yearlings. At this time the rigors of the rut and dodging hunters wears them out. They seek isolated locations to rest up. They find the nastiest, thickest cover around and stay there. Hunters have to go in there too if they want a big buck. During the rut, a stand over a breeding scrape is a good bet. All scrapes are not breeding scrapes. They differ in both size and location. Breeding scrapes are usually 2 to 4-feet in diameter and normally found in heavy cover with an overhanging bush or tree limb. Deer muddy the scrape with deer urine and leave tracks in it. Territorial scrapes are smaller and made in more open areas. They usually are located at the corners of wooded areas or along grain or alfalfa field edges. To hunt a breeding scrape, locate the stand downwind of the scrape about 20-yards and high up a tree. As the buck approaches a scrape he usually does so from downwind. Do not go anywhere near the scrape so as to avoid contaminating it with human scent. After selecting the area for the stand it is time to pick the exact location. Try to predict what the deer sees and where he will travel as he passes the stand location. Placement of a stand should be in natural surroundings. Use available materials to camouflage you and the stand. If there is a chance a rising or setting sun might outline you forget that location. You could sit there all season and not see a deer. Bowhunters especially need a clear shot as a single twig can deflect an arrow and ruin the chance at that buck of a lifetime. Tailor the spot to meet the need for clear shooting alleys by tying back branches and brush more open in the areas you thin a shot will present itself. Remember later to untie the branches and leave the woods the way you found it. This is better than cutting branches for cover or for stands. Choose a stand location that you can get into and out of with a minimum of disruption to the surroundings. Plan your path to the stand so that it will not encounter a trail along which a deer might travel. It is important that deer not know you are in the area. If possible enter the area with the wind in your face. A tree in a clump of trees is better than one more open no matter how good the shooting lanes. A pine tree with some limbs cut away works well as long as you are conscious of what the deer will see from ground level. Even better is just tying back the limbs so that when you are done with the stand, the string can be cut and the go back to the original place without damage to the tree. Remember that you will be in the stand for a long time. Think about your comfort and ability to remain still. People have different levels of tolerance for discomfort. Judge your stand according to yours. Once the stand is in place, you might have to move it in order to fine tune it. If you do, then do not use it for a few days so that the deer become accustomed to its presence. You might even place a gunnysack full of leaves in it so that they become use to seeing a shape in it. Later remove the sack and replace it with you. Think like a deer when considering treestand placement. It is hard work but pays dividends during hunting season. The reports of deer stand injuries and fatalities are beginning to trickle in as the season cranks up. Years ago hunting injuries due to shootings were quite high. 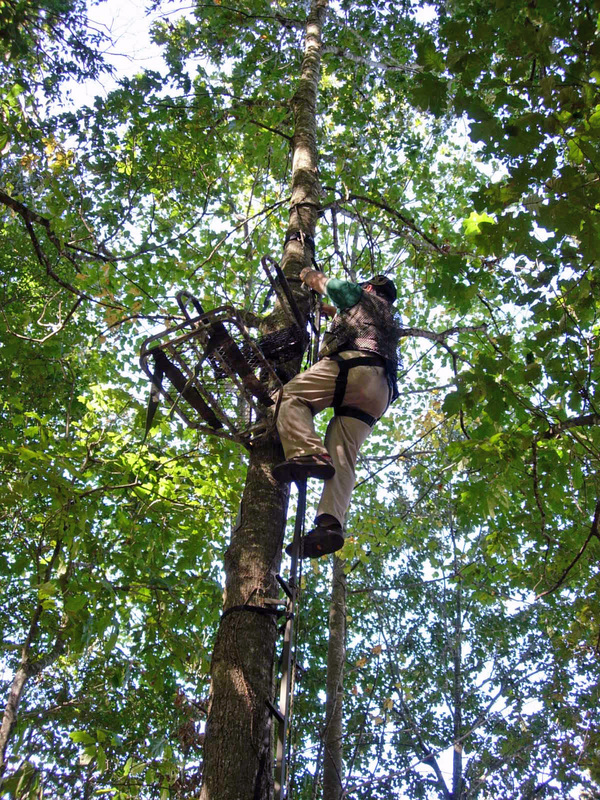 Then hunters began to take hunter safety courses and use treestands. The fatalities declined. Still injuries resulted from falls from treestands. There are no really accurate records of treestand injuries in particular. In a seminar presented at the SEOPA annual conference at Fontana Village Resort by Jay Everett, Hunter Safety Systems another aspect of treestand safety became apparent. Jay presented data pointing out treestand accidents do not all come as a result of falling out of the stand. To the contrary, 86% are the result of falls while getting into and out of stands. This can be ascending and descending or stepping on to and off of the stand. He explains that we have come a long way in treestand safety with the acceptance of harness systems in the stand. The main problem now is that people ignore the need to remain connected going into and coming out of the stand. Everett recommends the use of a lifeline to stay connected to the tree. The Life Line he recommends is one made by Hunter Safety Systems that makes use of a prusik knot. Everett stresses the need to keep the knot above your head in both ascending and descending from a treestand. He also recommends pulling pack and weapons up by a haul line after behind securely established in the stand. Other safety precautions recommended are always let someone know exactly where you will be hunting and keep your cell phone with you and turned on. Of course you should never pull loaded firearms up the haul line and be sure to keep the muzzle pointed toward the ground. During, before and after the season inspect all your equipment for wear and tear that might lead to failure. 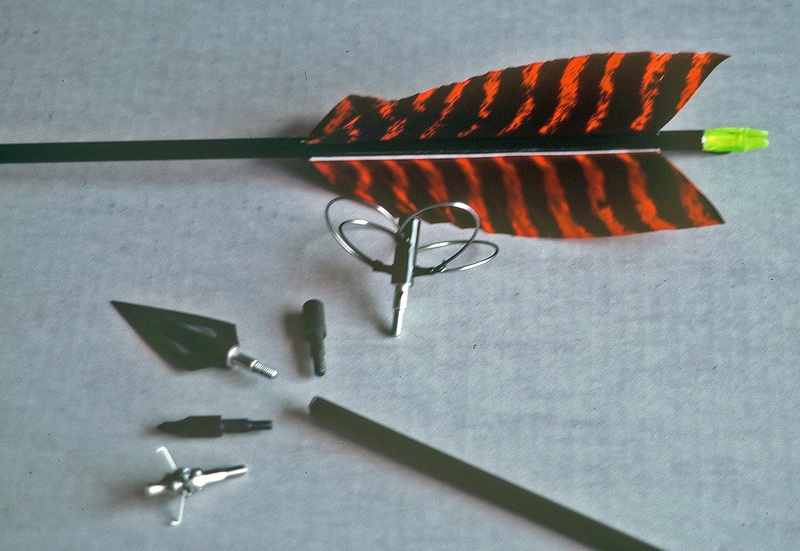 The goal of everyone is to reach zero death and disability from hunting related incidents. The life you save may be your own. All too often we spend more time dressing up our ground blinds and treestands with too little thought about where to place them. That often is a big mistake. Be aware of prevailing winds. Try to place stand in a location where the prevailing wind will be from the trail deer most likely to use in approaching you. A second choice is a position that has a cross wind. The idea is to prevent the deer from becoming aware of your presence by using his nose, his primary defense system. By locating your stand with your back to the sun and front to the deer you defeat another of the animal’s defense systems. Deer do not have a UV filter over their eyes like humans. They hate to look into the sun and avoid doing so as much as possible. By placing a treestand high you can be above his nose level. Fifteen feet is usually enough but be aware of wind currents carried over ridges. The nose level is also above any other scent line where your scent would carry it to them. This may be high but it does not have to be sky high. Some people place their treestands in the nosebleed area of a tree. So high that it causes ones nose to bleed from the altitude. Pick a tree that is easy to climb for safety sake. 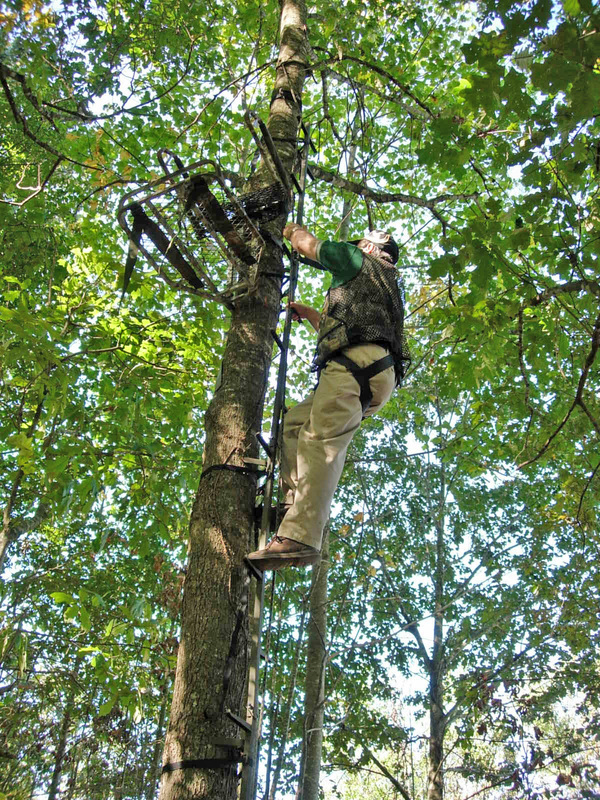 Be sure to use a harness and lifeline in going to/from and while in your treestand. Prepare your blind and stand locations so that you have shooting lanes that give a clear shot. If none is available then trim some branches and bushes to provide several shooting locations through which deer are likely to pass. It is advisable to remain concealed from the ground level in the case of tree stands. Do not allow yourself to present a silhouette against the sky. Deer do look up. With a ground blind you can use natural brush and other vegetation to conceal yourself and your blind. Les Frankland, Region V Fisheries Biologist for IDNR is the expert on the Ohio and the Wabash River. His recommendation is Smithland Pool for catfish. Fishing is available in the other two pools and the open water at the lower end where the river joins the Mississippi at Fort Defiance. Smithland is the largest pool running some 72 miles from Uniontown, KY down to the dam. It contains some 27,000 acres of water plus small embayment that hold fish. An embayment is a small tributary impounded when they built the dam. Frankland reports that the main channel of the river is probably too big to do much drifting. Anglers will put in and seek out areas around the grain elevators as well as any structure habitat areas such as brush piles and fallen trees. Two good locations are at Mound City and Old Shawneetown. Atwood reports that any place where grain is loaded attracts fish to the spilled grain. Anglers anchor out of the channel along the edge in the shallows. Those fishing below the dams will drift fish with cut shad. The blue catfish anglers like cut bait using skipjack or shad as they fish at Smithland off the rock pile. Flathead and channel anglers tend to prefer live bait and find fish the entire river anyplace where there are trees or brush in the water. The river level can vary from 9 feet to 90 feet in depth. The U.S. Army Corps of Engineers controls the water level for navigational and flood control purposes. Information about the water flow and depth is available on their website at http://www.CorpsLakes.us. The main channel and island borders of the pool provide flatheads, channels and blue catfish action. Tailwaters below the dam also produce the same action. Access to Smithland Pool is at Old Shawneetown, Cave in Rock, Tower Rock, Elizabethtown, Rosiclare, Golconda Marina, Golconda and Barren Creek on the Illinois side of the river. One can lock through the dam to fish the tailwaters. Otherwise one has to use the boat ramps at Smithland, KY.
Frankland has spent a lifetime in and around the Wabash River. 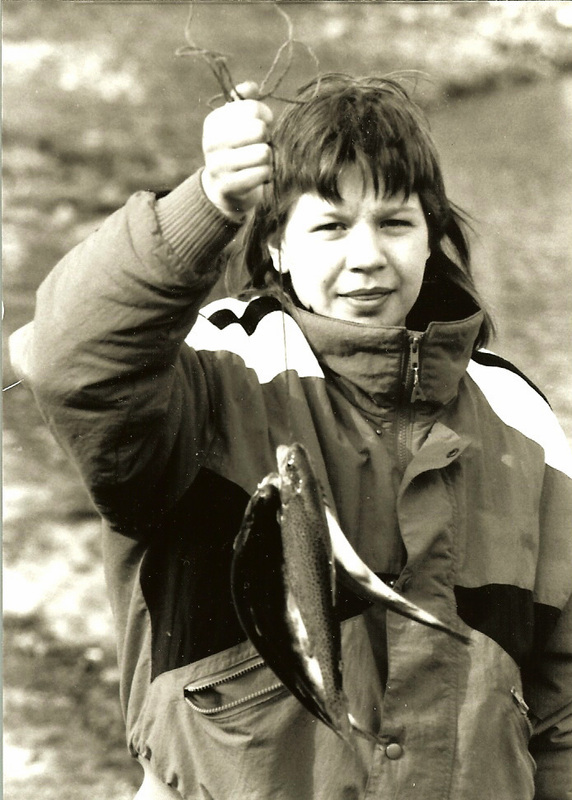 Growing up in the area, he fished it and later as a fisheries biologist for the IDNR, he has studied it. The Wabash is one of the largest free flowing rivers east of the Mississippi River. The Illinois portion is over 200 miles in length. It starts about 15 miles below Terre Haute, IN near Darwin and ends at Wabash Island on the Ohio River. 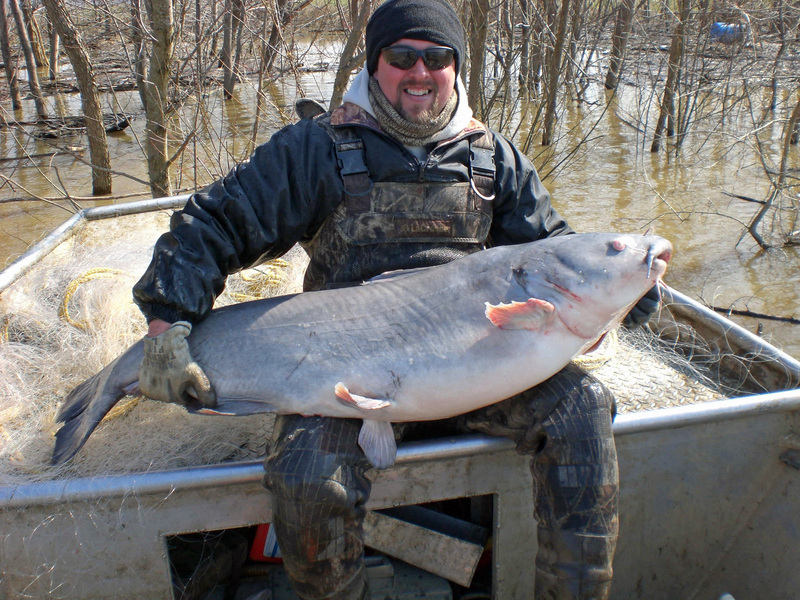 You can find blues, channels and flathead catfish throughout the entire length. There is angling access virtually all along the river. Some of the better known locations, according to Frankland, are around Darwin, along Vincennes, IN the stretch at Mt Carmel, the areas at New Harmony, IN and the area at the mouth of the Little Wabash near New Haven. The stretch of river below Maunie and the mouth of the Wabash River above Old Shawneetown are good locations. There are public boat ramps on the Illinois and Indiana sides of the river. Public ramps on the Illinois side are at Hutsonville, Westport, St. Francisville, Mt. Carmel, Grayville, Brown’s Pond near Maunie, and New Haven via the Little Wabash River. There are no navigational channels or commercial fishing on the Wabash. Water depth can be challenging to boaters. Depths can range from 6 inches to 50 feet. When the water is lower there are areas unpassable to boat traffic. Catchable trout fishing takes place in some 50 lakes and ponds across Illinois beginning on October 18th. For a complete listing of the sites check the website for Illinois Department of Natural Resources at http://www.dnr.iillinois.gov. Except for a few exceptions, anglers must possess an Illinois Fishing License and an Inland Trout Stamp. Specific license information is also available at the above website. Illinois is not often described as a refuge for trout anglers. The extreme heat of prairie state summers usually causes a die off of stocked trout from various private and IDNR stocking programs. The release of catchable trout generally occurs in the fall and spring for a short lived trout fishing season. A cold water species, rainbow trout cannot tolerate water temperatures exceeding 70-degrees. In Illinois summer water temperatures reach 70 to 90-degrees. In some deep lakes a process called stratification takes place. When this occurs, the top 20 feet or so contains layers of water with equal amounts of oxygen and with the same temperature. In summer that layer has enough oxygen for the fish but it is too warm. In about the next 20-feet the temperature drops rapidly to 39 degrees and the oxygen runs out. In the bottom 20 feet or more the temperature is 39 degrees and there is no oxygen. There are instances where some trout survive in that middle layer with just enough oxygen and cool temperatures. They find food in the cool water layer or take short trips to the upper layers to feed before returning to the cooler water, a thermal refuge. For this reason the stocking of the catchable trout does not take place until a few days prior to the opening of the season. Anglers use light line on light rod and reel combinations. They thread a piece of nightcrawler or worm on a small light hook and suspend it beneath an adjustable float. The bait is usually suspended about 18-inches beneath the float. But, by using an adjustable float one can experiment until he finds the depth at which the fish are feeding. Other popular baits include cheese, wax worms, minnows, red wigglers and just about anything else the mind can imagine.